Strategy classes are a staple for students in most business schools. Couldn’t universities – or all recruiters for that matter – take the brainpower and knowledge of their strategy professors and apply them to their own organisations? The following is a guest post – from an occasional series – by Michael Waxman-Lenz, Co-founder and CEO of International Education Advantage (Intead), a full-service consulting, strategy and digital international education solutions marketing company. 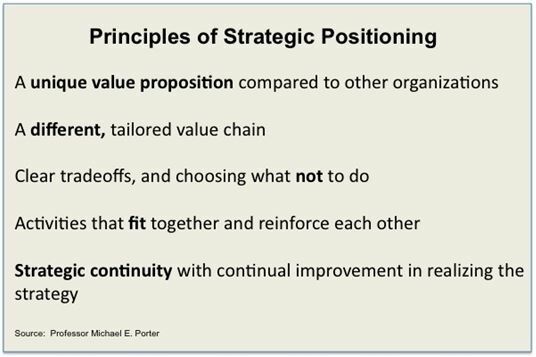 Mr Waxman-Lenz’s post explores some tried and true ideas about competitive strategy and strategic positioning. First of all, change does not come easily to any of us and certainly not to entire organisations. Many times it takes a dramatic event or crises to enact change. My sense is that higher education has entered a phase, not of an ultimate crisis, but a number of converging factors driving change such as: technological change increasing access to content, reduction in state funding for research and teaching, limits of the ability to raise tuition, and changing consumer behaviour. The prediction (see ICEF Monitor’s article “Goodbye university? Revolution vs. evolution of the current education model“) that 50% of all universities will go out of business in 50 years or less seems dramatic and exaggerated. Yet I think about changes in other industries that have been affected by the same factors during the past 20 years of my career: newspapers, travel agencies, and retailers selling books, videos, music, and greeting cards. Does it seem so dramatic that 50-100% of these businesses have disappeared? The activities have shifted to alternative channels or substitute products, mostly delivered digitally. Let me take you on a short journey to learn from one of my favourite strategy professors, Michael Porter from Harvard Business School, who created the concept of the five forces in his book Competitive Strategy, which analyses industries and competitive forces. I have applied the five forces model to higher education. It is a very high-level description since we should further distinguish between undergraduate, graduate, continuing studies and even by individual types of schools and subjects. The objective is to give you the basic conceptual thinking. The hard work of applying it to your particular situation will be left for you and your colleagues. Below is a short graphic depiction of how to analyse the five forces affecting your services. Keep in mind that the goal is to analyse and develop a strategy to successfully position yourself. New Entrants: This refers to new traditional campus-based universities opening – a very limited number of which have been established in recent years. An interesting new entry was the Olin College of Engineering in Massachusetts, USA established in 2000 and now ranking #4 on the US News & World Report list for this type of school. It started with a nice financial endowment but also developed a highly focused and well thought-out academic and operational strategy showing impressive results. Buyers/Users: Students, parents and alumni are the obvious clients contributing revenue to universities, but content licensors and research funders are critical as well. These stakeholders are in the centre of university services and their activities need to attract research funds, tuition revenue and alumni donations. The key is that most of the buyers have limited power within the university. However, a major donor or research funder like National Institutes of Health (NIH) does have a big impact. Depending on the university, the individual student has some negotiation power to enrol or not after admission is offered. Rivals: This includes all of your traditional campus-based competitors. You likely have a set of distinct competing schools already in existence depending on the type of university, rankings, location, etc. Attend any college fair, watch the mailbox of junior or senior high school students and you know that competition among the schools is robust to say the least. The postal service is grateful. Competition is intense. It plays out mostly indirectly by offering better terms to the individual students, attracting key faculty with better research and teaching arrangements. Suppliers: Universities purchase many services ranging from campus cafeteria food services and technology to the administrative and academic staff. Universities tend to be in a strong position to negotiate with vendors as there are plenty of service providers and usually alternatives for services. Substitutes: What can replace traditional on-campus learning? This is certainly the most dynamic, uncertain force to assess. The market is in a state of great change. Let’s start with a frequently overlooked substitute: non-consumption of a service. The means students choosing not to attend a particular college/graduate school or other type of higher education institution. Dropping out is also a way of non-consumption with serious consequences for the individual and the institution. New substitutes are now constantly emerging with a proliferation of digital platforms. MOOCs (Massive Open Online Courses), such as EdX and Coursera are the most visible potential substitutes. But to some extent, Khan Academy or Lynda.com are substitutes and complements to your existing education offering. One of the key questions in the future will be credentialing and how these programmes can document mastery of the content to potential employers. “Competition involves performing a set of discrete activities, in which competitive advantage resides,” says Mr Porter. His statement sounds so simple, but it is quite challenging to implement. Look at the principles below and think about the activities your school performs. We’ll finish with one example in higher education that applies many of these principles. Changing an entire institution is very challenging and many of the established structures, rules and regulations will make it particularly difficult to introduce dramatic change. WGU is an example of an organisation that was created with very specific strategic goals of teaching and reducing the cost of education. The organisation and processes were built around these goals. Specialisation and scale of operations frequently lead to improved quality and lower cost. So, WGU introduced a separation of teaching, grading, and mentoring. That means that a highly qualified academic professional (with higher compensation) focuses on teaching and will not spend time on grading or even mentoring. Meanwhile, professionally trained and dedicated mentors are assigned to guide and mentor the student throughout the programme. This separation of functions can help to establish cost-effective scaling and managing of these different elements of the education process. You will note that this strategy and execution also requires setting of expectations of students. In contrast to a small liberal arts college, the professor will not be available for extensive consultations and discussions with the student. The professor will also not be torn between research and teaching. Many of the recently established online education ventures had the same luxury as WGU to start fresh. 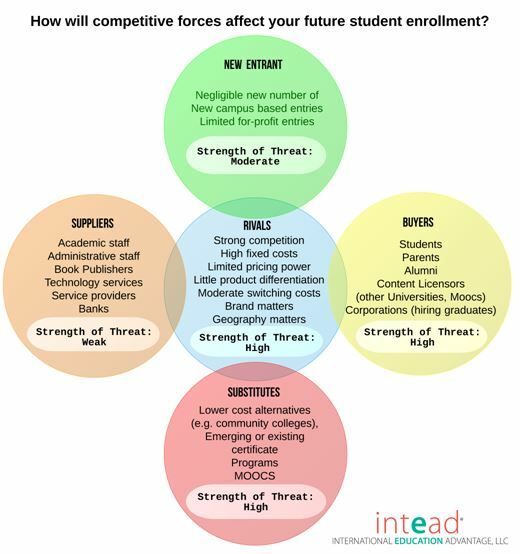 They also design their processes and cost structure on very specific educational outcomes and needs. There are a great deal more details, but WGU is a good example for strategic positioning within higher education. The Open University in the UK seems to be a similarly successful venture. I am not assigning a value judgement to these structures whether they are good or bad or whether I agree or not. I am giving them as examples for aligning the academic institution with specific objectives and the ability to achieve these limited number of objectives. You are the master of your destiny by setting the strategy in collaboration with many stakeholders. As for all existing organisations in the private or public sector, the challenge for existing campus-based academic institutions will be the multitude of existing stakeholders and interests and to review current processes, functions and tasks. Many tough decisions are to come. It is your judgement to know whether this hard strategy work is needed to be a viable academic institution in the future. Maybe your business school professors will have an answer to that question? Universities offer a similar service around the world. Developing a unique and differentiated value proposition is a challenging task. Nevertheless, this sameness will lead to a challenging situation for many institutions as demographic and cost pressures intensify and digital substitutes increase in effectiveness and credibility. Strategic planning and implementation are hard work but the alternatives of failing to do so can be even more costly. Mr Waxman-Lenz’s runs Intead’s office in New York City and also teaches as an adjunct professor at Baldwin-Wallace University and John Carroll University. His 25-year career spans activities in technology, academia, and doing business around the world. Prior to co-founding Intead, Mr Waxman-Lenz spent ten years in various senior executive functions at the Digital Media Division of American Greetings Corp. (AG), including strategic planning and rising to General Manager. He lived in Central Asia for five years and managed a Belgian venture capital fund. His previous work experience includes stints as a management consultant in Ernst & Young’s international division and as an economist at the Institute of International Finance (IIF). Mr Waxman-Lenz’s academic credentials include earning a Chartered Financial Analyst (CFA), a Masters degree from Johns Hopkins University (SAIS), as well as studies at the University of Konstanz in Germany and Kingston Polytechnic in London. He has completed executive education courses at Harvard Business School, Stanford Business School and Case Western Reserve University’s Weatherhead School of Business. This entry was posted in Africa, Asia, Australia/Oceania, Europe, Higher Education, Middle East, North America, Regions, South & Central America and tagged primary schools abroad, language schools, universities with international students, education abroad, student enrolment. Is employability data an untapped resource for student recruiters?